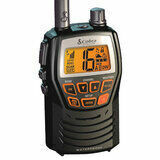 VHF (Very High Frequency) radios provide two-way communication and have a range of 5 to 30 miles. They are, arguably, the most important safety item onboard your boat, and are far more reliable than a cell phone, with its limited on-water range and dropped calls. 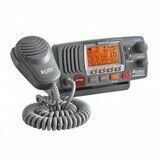 In coastal or inland waters, a VHF radio is generally the fastest link to rescuing agencies like the Coast Guard, a towing service or the harbormaster. Other uses include conversing with other boaters, listening to weather information and alerts, calling the race committee or communicating with a lock or bridge operator. Line of sight signals: unlike Single Sideband or shortwave radios, VHF radios transmit and receive line of sight signals. Mountains, land masses, the curvature of the earth or anything else that blocks vision in a straight line will also block VHF signals (although they do have the ability to “bend” around objects in a limited way). VHF radios only listen to the strongest signal they receive. If several boaters are transmitting simultaneously on the same frequency, you will only hear the one with the strongest signal, which will “step on” the other weaker transmissions. Redundancy if your electrical system fails: Handhelds have their own separate antenna and battery pack, so you don’t have to rely on your boat being fully functional, in case it’s hit by lightning or disabled by flooding, fire or electrical failure. Your handheld lets you call for help just when you may need it most, when your boat is sinking and your batteries are under water. Portability: communicate while you are away from the primary helm station on a large boat: on the foredeck, flying bridge or tuna tower. Handhelds link you to the mother ship from your dinghy and let you summon assistance when the outboard fails to start. DO YOU WANT A RADIO THAT FLOATS? If your radio goes overboard, a floating handheld gives you another chance to avoid a big disappointment and a trip to the store for a new radio. Although floating radios are a relatively recent idea, most of the handheld radios we’re selling now float. Note that there seems to be a trade-off between lightweight, floating radios, and radios with big batteries and the longest battery life, so you have to choose which feature, long run time or a floating radio, you prefer. Some radios has further enhanced their newest handhelds with their “Float ’n Flash” feature. These radios float face-up, and the screen, buttons and several LED lights on the base all flash on and off. Several Standard and West Marine radios include a similar feature, with a flashing red LED on the radio’s base. Radios operate for a range of between 7 ½ and 20 hours. Battery life depends on the radio’s physical size, which determines just how big of a battery it will hold, whether it transmits at 5 or 6 watts on the high power setting, and if the battery pack also powers a GPS receiver. In general, floating VHFs have shorter battery life than heavier, non-buoyant models. What matters most to many boaters is the answer to this question; will the radio operate all weekend without a recharge? DOES THE RADIO HAVE A DOT MATRIX DISPLAY? Many radios use a seven-segment LCD display. As its name implies, numbers in seven-segment displays are composed of seven individual elements, and they create the type of chunky, rectangular numerals we’re all familiar with. Each part of the screen, such as the battery life indicator, has segmented components that perform just one function. Dot matrix displays are miniature versions of LCD screens seen on TVs, smartphones and other devices. They can display any monochrome pattern of dark and light elements, make choosing functions simpler, and allow rounder, more lifelike and readable numerals. Dot matrix displays are rated for screen resolution by their pixel count. DO YOU WANT A BUILT-IN GPS RECEIVER WITH DIGITAL SELECTIVE CALLING? Several radios include a built-in GPS receiver, which you can use for navigation, providing your Lat/Lon position and allowing you to navigate to stored waypoints. These VHF/GPS combo handhelds include Digital Selective Calling (DSC), which functions as a sort of VHF-frequency emergency beacon. Just push and hold down the red DISTRESS button on your handheld VHF radio, and it sends an automated digital distress message to the Coast Guard and all other DSC radio-equipped vessels. Rescuers instantly know who you are, where you are (using GPS coordinates), the name of your boat and the phone numbers of your emergency contacts. DSC also provides non-emergency capabilities, allowing you to communicate individually with another boat or group of boats using MMSI numbers. You can send and receive each other’s positions as well, if your radio and the other vessel’s radio are interfaced to GPS. While we’re excited by the promise of these features, we actually haven’t heard of many of our customers using them, and the user-interfaces of the radios can make the more complicated features challenging to use. To get the safety benefits of DSC you must obtain your nine-digit MMSI number. DOES THE RADIO HAVE ESPECIALLY USEFUL ACCESSORIES? Drop-in chargers make it easier to keep the radio powered up, so it is ready when you need it. There are two types: slow chargers (9 to 15 hours) and rapid chargers (2 1/2 hours or less). Rapid chargers have voltage regulation and sensing circuitry to turn themselves off. This may not be the case with slow chargers. The best solution, in our opinion, is a fast drop-in charger base with interchangeable 12V DC and 230V AC power cords. Alkaline battery packs let you use inexpensive, long-storage-life disposable batteries in your radio. They allow your radio to keep operating when you’re not able to recharge, and at 20°C, they still have 90% of their capacity after three years of storage. In emergencies a spare pack of alkaline batteries can be a lifesaver. Antenna adapters connect your handheld to the ship’s antenna. 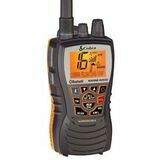 This extends the range of the handheld dramatically, and is an important safety feature should your fixed radio fail. The type of adapter varies with the brand of radio: most use a BNC connector, while others use a special connector. All provide male PL-259 threads for connection to the antenna coax cable. Some companies also offer VOX or voice-activated transmission headsets, which means you don’t even have to press the PTT button before speaking. They, too, provide private listening. WHAT ARE THE LIMITS OF RANGE AND POWER? Maximum power: fixed-mount radios are legally limited to 25 watts of transmit power. All have the option of transmitting at one watt of power so that short-range conversations are less likely to interfere with large numbers of boaters. It’s a good idea to try to reach your party on one watt before switching to 25 watts. Antenna: your antenna installation is the most important variable affecting the operating range of your VHF. Mount your antenna as high as possible: on the mast of a sailboat or on the superstructure of a powerboat. Use an antenna with 6 or 9dB gain on powerboats and 3dB gain on sailboats. Use large-diameter, low-loss coax cable with properly installed connectors and run it as directly as possible to the radio. Battery power: fixed VHF radios receive power from your boat’s battery bank, so your operating time is essentially unlimited, because they draw about half an amp while receiving, and about five amps while transmitting at maximum 25 watt power. The only problem is that, if your battery system goes dead, so does your VHF radio. 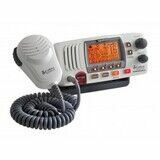 A handheld VHF is thus an important backup in an emergency. All fixed VHF radios include Digital Selective Calling capability, which is part of the international protocol of safety procedures in the Global Maritime Distress Safety System (GMDSS). DSC provides handy non-emergency functions, allowing you to communicate individually with another boat or group of boats. You can privately send and receive positions (referred to as Position Request or Position Polling) with your buddy boats to rendezvous at that secret location where the fish are biting, for example. What’s more important are DSC’s emergency capabilities—functioning like a sort of coastal EPIRB. In an emergency, one push of a button makes your radio send an automated digital MAYDAY message on VHF Channel 70, which can be received by all other vessels within radio range and the Coast Guard. It transmits your vessel ID number, called an MMSI Number, as well as your position and the nature of your distress call (undesignated, fire, flooding, collision, grounding, capsize, sinking, adrift, abandoning, piracy, MOB). The radio then automatically switches to Channel 16 for voice communication after this information has been sent, allowing you to communicate by voice with would-be rescuers. All DSC radios sold in March 2011 or later (Class D radios) have a separate “watch standing” receiver that constantly monitors DSC Hailing Channel 70. The radio’s other receiving channel is free to listen to any other channel. Radios built to these standards also include additional features including added memory to store other vessels’ MMSI numbers. Older radios may only have one receiver (so you could possibly miss an emergency call while listening on a different channel) or may not have DSC at all. Many radios can use one or more optional full-function microphones that even include a channel display. Change channels, change volume levels, add or delete channels from the scanner's memory: all are possible from the keypad included in these miniature second stations that are ideally suited for the flybridge, tuna tower, navigation station, cockpit, or wherever you could use VHF communications. Second stations are a good alternative to keeping a less-powerful handheld VHF at a second location. These remotes use the full power of the fixed-mount radio (25 watts) and the effectiveness of a full size antenna to ensure that you have excellent range. Soft-key interfaces use three or four multiple-use keys to perform many tasks on radios that are more feature-laden. Toggle between software key functions. ICOM’s new family of radios (the M424, CommandMicIV and handheld M92), Garmin’s GHS 20, and Standard’s GX1600/GX1700 all share this approach. Multi-function rotary knobs are quicker than keys when changing a function. The knobs on the Garmin GHS 20 and ICOM CommandMicIII control Channel, Volume, Squelch and other features. UP and DOWN keys, the other typical alternative, can be held down to move from one channel to the next in rapid succession. Most radios now have channel selector buttons on the microphone as well as on the radio itself. We like the convenience of this feature. All VHF radios have a special button that immediately selects emergency Channel 16. Noise-canceling microphones reduce background noise so you can hear and be heard more clearly. If you are in a fast, open-cockpit boat this is a valuable feature. External speakers: Virtually all radios have a jack or connection for an optional external speaker. This can make it far easier to hear the radio in a noisy environment like engine noise in the cockpit, or wind or water noises. Virtually all radios now have several scanning options, so this has ceased to be a reason to buy one radio over another. There are variations on this theme, however, and you should become familiar with the terminology. Dual Watch or TriWatch allows you to monitor a working channel, like VHF Channel 72, and then pop back to VHF Channel 16 to check for traffic every two seconds or so. This is related to the requirement that mariners maintain a watch on Channel 16 so they can go to the aid of someone broadcasting a Mayday, as well as to listen for their vessel being hailed by another boater. TriWatch adds VHF Channel 9 to the scan list, which can be a hassle in areas where VHF Channel 9 is used for fishing chatter. In any case, virtually all radios have Dual and/or TriWatch. Tag Scan allows you to select any number or combination of channels to monitor. Most radios also offer this feature. Cobra MR HH125 является полнофункциональным УКВ-радио с прочной компактной конструкцией. Она идеально подходит для яхтсменов или в качестве запасного средства связи на более крупных судах. IPX4 (водонепроницаемая) - Сканирование: по всем каналам - Dual Watch (сканирование каналов 16 + 1) - TX мощность: Макс 3 Вт - Мин 1 Вт - Мощность звука: 250 мВт - 8 Ом - Питание: 5 х ААА батареи - Продолжительность: 9 часов (26 часов с щелочными батареями) - Размеры: 102 х 62 х 31 мм - Вес: 141 г без батарей - Другие характеристики: Roger Beep, индикатор уровня заряда батареи, блокировка клавиатуры. Технические детали: Водонепроницаемость и плавучесть до IPX7, Мощность 1/3/6 Вт, Все международные каналы, Эксклюзивная функция BURP для изгнания воды из решетки динамика, Сканирование каналов и памяти, Tri-Watch: 16 + 2 программируемых каналов, Вход для внешнего микрофона / динамика, Неограниченное программирование каналов, Подавление фоновых шумов, Блокировка клавиш для предотвращения случайного использования. В комплекте 1000 мАч батарея + 220 В настольное зарядное устройство + 12 В зарядное устройство для прикуривателя + антенна + крепление к поясу. Размер: 121 х 67 х 53 мм. Эта рация имеет функцию Bluetooth с интерфейсом мобильного телефона. Продукт может быть использован в качестве стандартного УКВ, или в качестве телефона с помощью соединения Bluetooth. Технические данные: Водонепроницаемость и плавучесть до IPX7, 6 В мощности, Все международные каналы, Функция "перемотки" для прослушивания последних звонков, Эксклюзивная функция BURP для слива избытка воды из решетки динамика, Неограниченное программирование каналов, 16 + 2 избранных каналов - разъем для внешнего микрофона / динамика, Сканер для занесенных в память каналов, Блокировка клавиатуры для предотвращения случайного использования, Подавление фонового шума. В комплекте 1000-мАч литиевая батарея + 220 В зарядное устройство + 12 В зарядное устройство для прикуривателя + антенна + крепление к поясу. 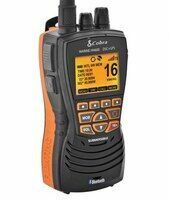 The Cobra Marine® MR HH 600 VHF radio with GPS & DSC is Cobra’s first handheld radio that shows your GPS coordinates and automatically transmits them with DSC calls to notify the Coast Guard or other vessels of your exact position in case of emergency. This life saving radio also features a floating orange core so it’s easy to see in water and has a built-in flashlight and emergency strobe. Selectаble Output - Select between 1, 3, and 6 Watts for short and long range communication. Rewind-Say-Again® – Replay missed VHF calls. Make and receive phone calls using Bluetooth Wireless Technology, keeping your cell phone safe and dry. Dimensions: 131 mm x 72 mm x 47 mm. Weight: 329 grams. Icom M35 прошла типовые испытания и соответствует директиве 1999/5/CE. IPX7 водонепроницаемая и плавающая. 6 Вт/1 Вт диапозон мощности. Autoscan. 70 программируемых каналов. Быстрый доступ к 16 каналам. Срок работы литий-ионной батареи: 8 часов. Оснащена традиционной ручной регулировкой громкости и дополнительной автоматической регулировкой в зависимости от уровня акустической среды. Микрофон, позволяет избежать помех. 4-уровневый индикатор заряда батареи. Дополнительный HM-165 водонепроницаемый микрофон. Оснащена BP-252 батареями, зарядным устройством и зажимом для ремня. Cobra MR F57 - мощная УКВ-радиостанция с большим ЖК-дисплеем. Выбираемый выход 1 Вт или 25 Вт идеально подходит для ближней или дальной связи. УКВ-радиоприемник включает в себя эксклюзивный цифровой рекордер Cobra Rewind-Say-Again®, Plug N Play, внешний приемник GPS (с использованием дополнительного Cobra CPS CM 300-005), 4 функциональные клавиши, расположенные в нижней части ЖК-дисплея, чтобы пользователь мог легко активировать и перемещаться по меню. NOAA Weather Radio, Weather Alert, обеспечивающий 24-часовой доступ к аудиопередачам и экстренным оповещениям, чтобы обеспечить безопасность и информирование моряков, IPX8 / JIS8 Submersible, Instant Channel 16/9, Scan, PA (Public Address), выход внешнего динамика, Освещенный LCD, измеритель силы сигнала (для радиоприемника и внешнего приемника GPS). Соответствует последним спецификациям FCC для VHF-радиостанций класса D. Rewind-Say-Again® - Повтор пропущенных вызовов VHF. Автоматически записывает последние 20 секунд с помощью цифрового диктофона. Проверка радио - проверяет напряжение батареи при передаче, выходную мощность радиочастоты и выход антенны. Погружные - разработаны для стандартов IPX8 (JIS8). Вес: 1,22 кг. Размеры: 76,2 x 152,4 x 158,78 мм. Cobra MR F57 - это мощная УКВ-радиостанция с большим ЖК-дисплеем. Выбираемый выход 1 Вт или 25 Вт идеально подходит для ближней или дальней связи. УКВ-радиоприемник включает в себя эксклюзивный цифровой рекордер Cobra Rewind-Say-Again®, Радио NOAA, оповещение о погоде, обеспечение 24 часов, радиовещание погоды NOKIA, предупреждение о погоде. Доступ к аудио-трансляциям и экстренным оповещениям для обеспечения безопасности и информирования моряков, IPX8 / JIS8 Submersible, Instant Channel 16/9, Scan, PA (Public Address), выход внешнего динамика, подсветка LCD, измеритель силы сигнала (для радиоприемника и внешнего GPS-приемника.) Соответствует последним спецификациям FCC для радиочастот VHF класса D. Rewind-Say-Again® - Повтор пропущенных вызовов VHF. Автоматически записывает последние 20 секунд с помощью цифрового диктофона. Проверка радио - проверяет напряжение батареи при передаче, выходную мощность радиочастоты и выход антенны. Погружная - разработаны для стандартов IPX8 (JIS8). Вес: 1,22 кг. Размеры: 76,2 x 152,4 x 158,78 мм. Cobra MR F77 - это поистине уникальная УКВ-радиостанция с большим ЖК-дисплеем и встроенным GPS-приемником, благодаря чему радио готово к работе сразу после выхода из коробки, чтобы стать полноценным спасательным решением. Если пользователь отправляет сообщение «Бедствие» Distress, ТОЧНОЕ МЕСТОНАХОЖДЕНИЕ судна будет сразу отправлена спасательным службам. Выбираемый выход 1 Вт или 25 Вт идеально подходит для связи на коротких или дальних расстояниях. В комплект входит цифровой диктофон Cobra Rewind-Say-Again®, 4 функциональные клавиши, расположенные внизу ЖК-дисплея, чтобы пользователь мог легко активировать и перемещаться по меню. IPX8 / JIS8 Submersible, Instant Channel 16/9, Scan, PA (Public Address), выход внешнего динамика, ЖК-дисплей с подсветкой, измеритель силы сигнала (для радиоприемника и приемник GPS) и т. д. Соответствует последним спецификациям FCC для VHF-радиостанций класса D.
VHF IC M423G ICOM со встроеным GPS, DSC, а интуитивно понятный пользовательский интерфейс упрощает ее использование. Под дисплеем есть кнопки для упрощения навигации в системе меню. Встроенный GPS-приемник отображает текущее положение и время на дисплее. Радио использует общий формат NMEA0183 для передачи с GPS. Встроенное активное шумоподавление уменьшает фоновый шум на 90% и улучшает как исходящие, так и входящие вызовы. Вы услышите и будете услышаны! IC M423G имеет встроенный аудио усилитель, который обеспечивает мощный звук при использовании внешнего динамика. С помощью функции общего доступа вы можете говорить в микрофон как в мегафон. Противотуманный звуковой сигнал также может посылать звуковой сигнал на внешний громкоговоритель. AIS350 Raymarine AIS A / B класс приемника. Двухканальный приемник позволяет отслеживать сигналы AIS350 передатчиков класса А и В. Устройство позволяет одновременно использовать SSeatalk NG (NMEA2000), NMEA 0183 и USB соединения. Как и в предыдущем поколении устройств AIS350 интегрированный NMEA 0183 мультиплексор, позволяет достич скорость соединения 4800 и 38400. Raymarine AIS650 передатчик класса B и A / B AIS приемник. Двухканальный AIS650 позволяет улавливать сигналы класса А и В и посылать сигнал класса B. Устройство позволяет одновременно SEATALK Н.Г. 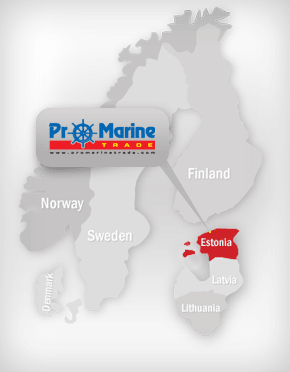 (NMEA2000), NMEA 0183 и USB подключения. Как и в предыдущем поколении устройств AIS350 интегрированный NMEA 0183 мультиплексор, позволяет достич скорость соединения 4800 и 38400. Также имеется слот для карт памяти SD, карта памяти может быть использована для хранения данных.